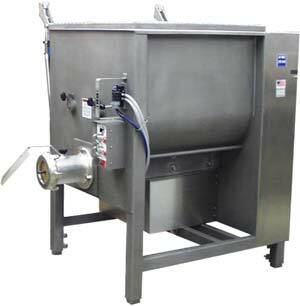 This reliable AFMG series of mixer grinders are extremely fast producers. They all feature an air operated lid, just flip the switch and the lid will open or close. Belt drive on grinder for a quiet and maintenance free operation. The mixing paddles overlap for a fast and better mix in forward and reverse mixing. 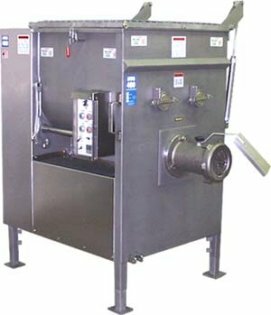 Automatic product feed for grinder. Easy to remove paddles, powered by a 5 HP motor. Adjustable machine height. Has a split grated lid for low ceiling heights. No. 56 or 66 grinding head. Safety switch on lid. Ring, bowl, and auger are stainless steel. Control panel can be mounted in front or on the side. Includes splash guard. Working Capacity 400 Lbs., 600 Lbs, 800 Lbs.